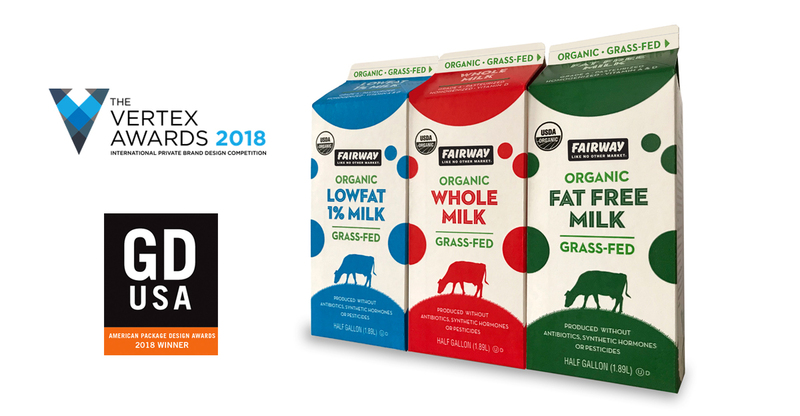 We are proud to announce that our package design for Fairway Market’s Grass-Fed Organic Milks have been chosen as a bronze award winner in the 2018 Vertex Awards. The Vertex Awards are the only global competition devoted exclusively to the art of private brand package design. It is a great honor for our work to be recognized by the judges and to be among the talented group of designers from around the world who won in this year’s competition. New York City-based grocer Fairway Market is one of the highest grossing food retailers per square foot in the US, with 14 store located throughout the New York metro area. Our Fairway Grass Fed Milk package design has received a lot of recognition, in addition to the Vertex award the milk packages were recently featured in Packaging of the World and have won a 2018 American Package Design award from Graphic Design USA. The Grass-Fed Milk design is part of a larger branding effort by Nancy Frame Design to refresh Fairway Market’s private label brand of premium and organic foods. Our design system delivers visual punch on the shelf across categories inferring purity, value and the Fairway exuberant experience, where “taste is first”, shopping is an adventure and eating is a celebration. See more of our work for Fairway.